February 7, 2016 - On Friday former president of Sikorsky Aircraft, N551JP and his passenger were killed when their single engine P-51D Mustang, a World War II vintage aircraft cashed in Maricopa, Arizona about 35 miles south of Phoenix. Pinal County Sheriff's Office reported they responded to a call of a plane crash. Upon arriving to the crash site, they found the P-51D Mustang being consumed by fire and quickly shoveled dirt to distinguish the fire. 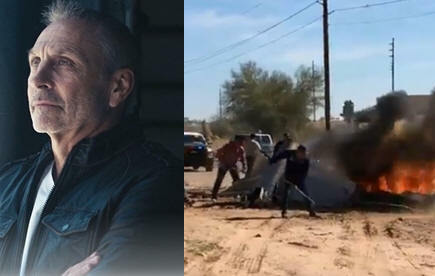 The Sheriff's Office has identified two bodies found in the aircraft; former president of Sikorsky Aircraft, 61 year old Jeffrey Pino of Chandler, Ariz. and 72, Nickolas Tramontano of Brookfield, Connecticut. Pino held a commercial pilot certificate and instrument rated in multi and single engine aircraft and rotorcraft-helicopter, he also was held ratings as a flight instructor aircraft and rotorcraft-helicopter.He was type rated to fly (C/EA-500S) the Extra EA-500, a six-seat single-engine turboprop aircraft, which is manufactured by Extra Aircraft company. Pino owned four aircraft, the Bell 47G-4A, N474JP, Eclipse Aviation Corp EA500, N508JP, North American F-51D, N551JP and Howard Aircraft DGA-15P, N9599H. ​ Pino was Sikorsky's president from 2006 to 2012, he then moved on to become CEO at Macquarie Rotorcraft Leasing. His tenure there was for a short period of time, he then went to work for Colorado-based XTI Aircraft as their vice chairman. Founder and chairman of XTI Aircraft Company, David Brody said, "There are no words to express the grief and sadness we feel at the passing of our very dear friend and colleague Jeff Pino". Dan Schultz, current president of the Stratford, Connecticut based aircraft manufacturer, Sikorsky Aircraft said, "The Sikorsky family is saddened to learn of the sudden loss of former President Jeff Pino. We extend our heartfelt condolences and prayers of sympathy and support to his family and friends during this difficult time. During his six years as President of Sikorsky, Jeff brought personal energy and passion for aviation innovation to our industry. "It was during his time leading Sikorsky that the company first flew the X2 Technology demonstrator. We remember Jeff as a leader, pioneer, innovator and advocate. May his family be comforted by the lasting impression and legacy Jeff has left behind."